Renda Writer, who started as a writer not a visual artist, and then segued into poetry and acting, thinks every truth in life can be boiled down to a phrase. His goal as an artist is to make his handwriting into visual art and to shed light on the general idea that handwriting can be seen as art. Pictured here, artist Renda Writer posing with dogs at Barkhaus. It’s a sunny breezy weekday afternoon and artist Renda Writer is getting material out of his traveling studio van to create a new mural. The van is replete with spray paint, neatly stacked boxes of over 100 completed artworks on canvas, books, markers, a bed and flat screen TV. 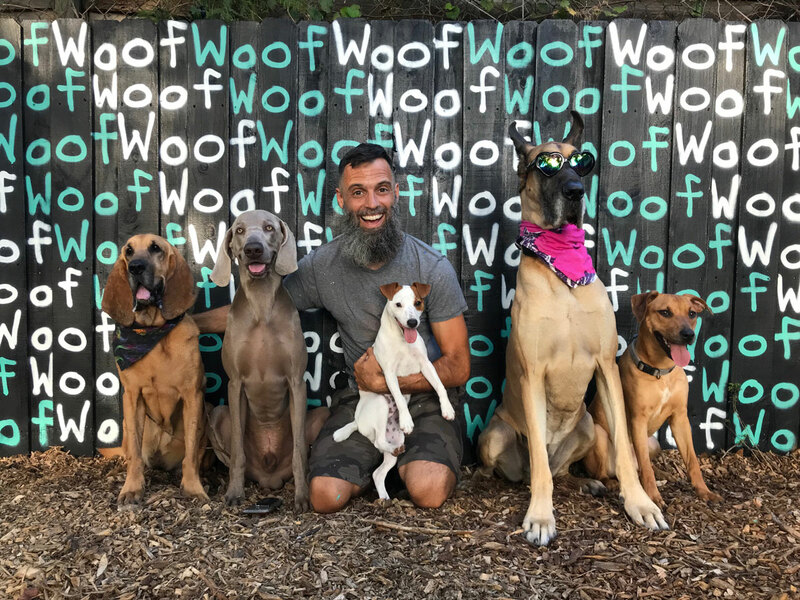 His most recent mission was to paint a mural at Barkhaus, a pet boarding facility in Miami’s Little River district that has a roomy dog run yard surrounded by a wooden fence. Renda painted the mural on whole black fence, the word Woof repeated in an offset grid. He worked with the slats of the wood fence, starting at the top left – like every good writer – and works straight across, alternating colors as he goes. He bumped the word by one letter. The mural was done in three hours, he signed his name on it, as well as Barkhaus’s at the bottom in a pop of pink amid the cool turquoise and white. Barkhaus’ dogs currently in residence lined up in approval for a photo, the Great Dane playing the hip card with sunglasses on. Watch Handwritten Mural by Renda Writer at The Barkhaus in Miami. Renda Writer started as a writer not a visual artist, and then segued into poetry and acting – everything word based. He started making art in 2012 and the murals about 4 years ago. His very first work was in Wynwood when he started work on a project at N’Namdi Contemporary art, in the heart of the internationally popular Wynwood Arts District of Miami. He set out on the task of using only simple white paint marker to write a simple 2-sentence mantra over and over on the 30 ft x 30 ft exterior blue wall of the famed art gallery and offered to paint his wall for free. That mantra was “Love is a risk. Do it anyway.” and it was written approximately 500,000 times across the entire expanse of the wall, taking about 350 labor hours, over the course of 6 weeks. After that the work started to pour in. The talk on the streets was mirrored by an explosion of attention on social media, as Renda’s mural was photographed, uploaded, tagged, and shared on Instagram, Facebook, and Twitter, creating a viral phenomenon whose effects are still rippling outward today, as people continue snapping pics of themselves in front of the mural and spreading them across the internet. His “Handwritten Murals” draw on influences and inspiration from street art, graffiti, typography, public art, poetry, mantras, and pop-art-like repetition. 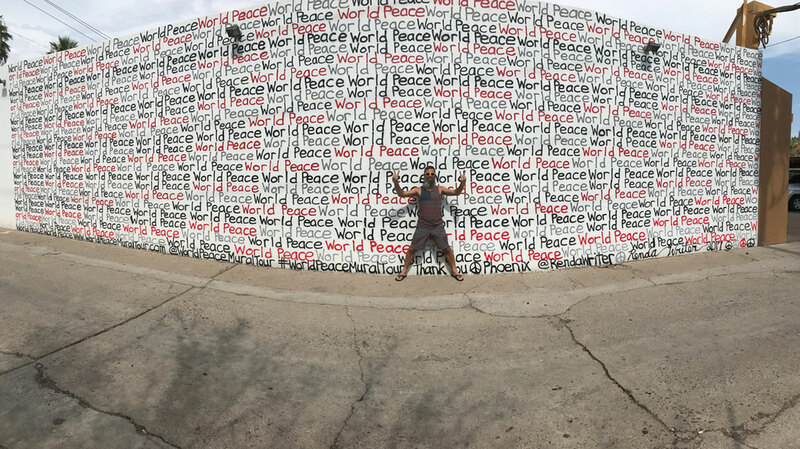 From there, Renda has gone on to complete over 100 handwritten murals, and has also started The World Peace Mural Tour, where he goes around the world creating a mural with those words. The tour is aligned with the idea of “writing things into existence,” and presents a way of using the power of words and the medium of public art to spark conversations and effect change. It started with the first mural, on April 23rd, 2016 at Georgia-Jones Ayers Middle School in the Allapattah neighborhood of Miami. Renda Writer also does “Handwritten Body Art” with his signature “L7 Pattern” using various colored paint markers. He does a line of clothing of hats, t-shirts and dresses. With his chiseled looks, Renda has done acting, appearing in “Magic City,” “Charlie’s Angels,” “The Glades,” and “South Beach Tow.”  He has also done quite a bit of commercial work, acting in commercials for several local car dealerships, as well as commercials for popular brands such as Nike, Sprite, and Swisher. His work is taking him to California this summer and then who knows where. “One mural leads to another,” he says with a smile.